How can T-REX save me money? Catalog maintenance is one of the most difficult and time-consuming jobs in any data center. Its complexity and importance usually dictates that senior level programmers be applied to the task. 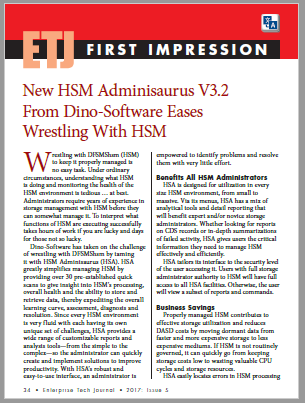 T-REX enables more junior staff to perform catalog maintenance after hours when systems programmers may not be available. Programmers that might otherwise be assigned to tediously restoring and rebuilding lost catalogs can then be used more productively. T-REX’s diagnostic routines will identify catalog anomalies and either automatically fix the problem or generate control cards to correct them. The routines can also be run using ISPF panels or from a Windows or Linux workstation (currently under development). This solution provides a savings of hundreds of man-hours per year that would normally be applied to diagnostic and corrective work. Additionally, minimizing downtime caused by physical or logical errors in VSAM clusters or ICF catalog structures contributes to greater business continuity and in many cases, may eliminate penalties incurred by failing to meet service level objectives. 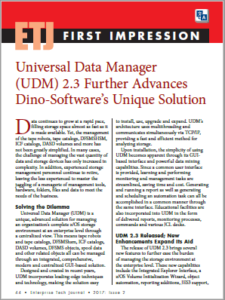 T-REX’s broad catalog management capabilities eliminate the need to purchase and maintain the many smaller utilities currently required for back-up and disaster recovery needs. Many sites have separate products for reporting, SMF forward recovery, tape management synchronization, backup and restore. 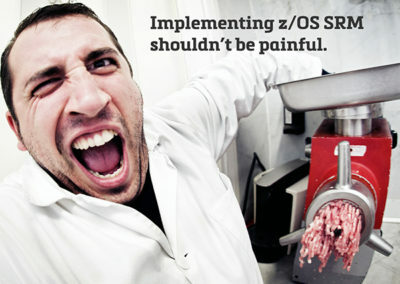 This is a real support challenge when incompatibility issues arise during operating system upgrades. 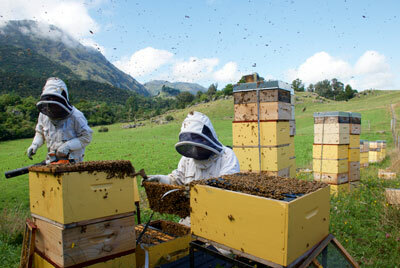 Retesting is often required and new maintenance must be applied to each product. With T-REX there is no need to learn and work with different utilities from an assortment of vendors. 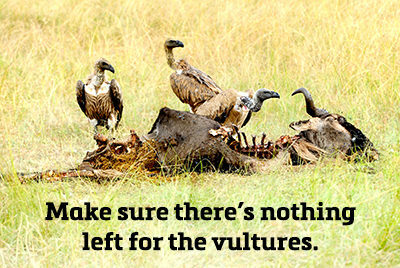 Consistency in use and syntax ensure precious minutes are not lost when you are trying to get your system back on-line. 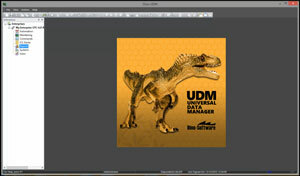 T-REX by Dino-Software has everything needed for catalog maintenance and recovery in one comprehensive product. Blinding Speed. Recover in Minutes – Not Days! 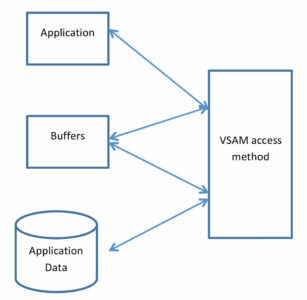 Manually recovering catalogs and broken VSAM clusters can take days, even with experts on-site. Often transactions that occurred since the last backup are lost. 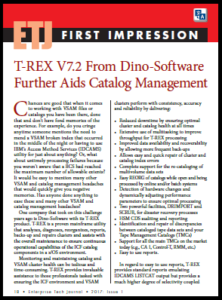 With T-REX, not only can you recover and repair broken catalogs in minutes, but you can forward-recover the last transactions using System Management Facilities (SMF) data. T-REX handles every important catalog management task, including analyze, diagnose, report, backup and repair of ICF cluster (Integrated Catalog Facility) components. 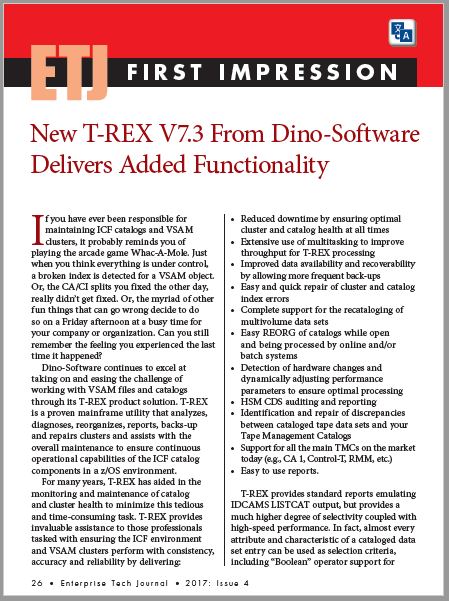 T-REX can back up and recover VVDSs eliminating the need to perform costly and time-consuming full-volume restores. 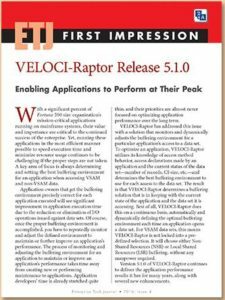 You can also use T-REX to dump and rebuild VVDSs to enlarge them or to consolidate extents. Its LISTCAT command can identify overallocated data sets to reduce DASD waste and cut unnecessary expenditure. T-REX gives you the ability to back up multiple BCSs or VVDSs to a single data set or multiple data sets. This simplifies catalog maintenance and management, making it easy to perform mass modification for device conversions, to change volume serial numbers of DASD volumes, and to synchronize alias entries for user catalogs residing on shared DASD.